What a load of bulgogi. The grilled, marinated meat from Korea is suddenly on the media's plate after this strange ad was placed in The New York Times last week. 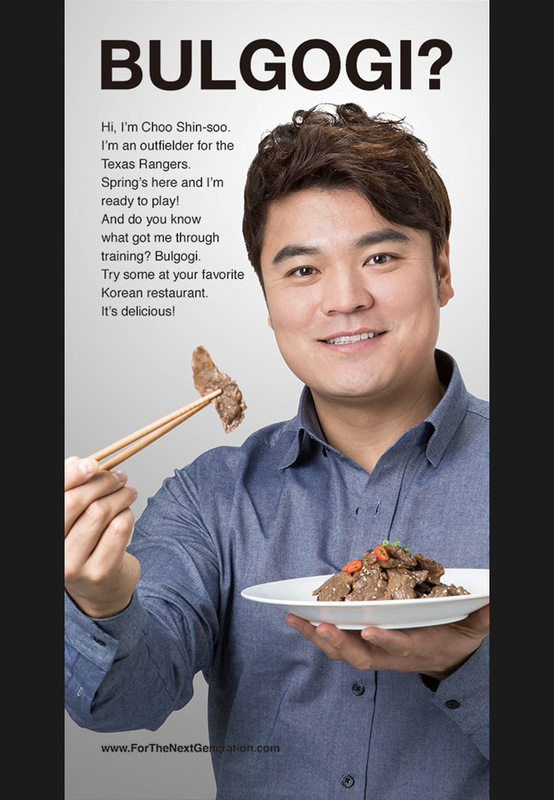 Texas Rangers outfielder Shin-Soo Choo—a huge star in his native South Korea, but not so much in this country, where he actually plays—offers up a morsel with chopsticks. Copy begins: "Spring's here and I'm ready to play! And do you know what got me through training? Bulgogi. Try some at your favorite Korean restaurant. It's delicious!" Thanks for the tip, Choo! Sure, the ad is random and goofy, but I'm surprised it has sparked so much attention. Maybe it's because it doesn't tout any specific brand, group or eatery, just the beef dish in general. A Web address in the ad, ForTheNextGeneration.com, contains links to English-language news about South Korea, and holds a clue to the strange ad's origin. NPR, among others, investigated, and traced the placement to Sungshin Women's University visiting professor Seo Kyoung-duk—a passionate promoter of Korean food and culture—and restaurant chain Chicken Maru, which apparently picked up the tab. Wade Boggs famously ate chicken before every game and wound up in the Hall of Fame. Maybe they should get Choo on that next!